During the Manhattan Project, she worked at Columbia University, helping develop the process for separating uranium metal into U-235 and U-238 isotopes by gaseous diffusion. This process was replicated at a grand scale at the K-25 Plant in Oak Ridge. She also developed improved Geiger counters for measuring nuclear radiation levels. 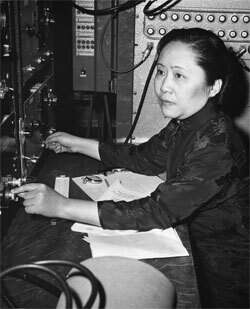 She is believed to have been the only Chinese person to have worked on the Manhattan Project. Born in a small town near Shanghai, Wu attended a school started by her father, who believed in education for girls, despite it being an uncommon belief at that time. Wu went on to study physics at a university in Shanghai, where one of her professors had worked with Marie Curie. After graduation, she became a research assistant when her supervisor encouraged her to pursue advanced education in America. In 1936, Wu arrived in San Francisco, with some financial assistance from an uncle. She enrolled at the University of California, Berkeley where she completed her Ph.D. in 1940. She married Luke Yuan, a fellow physicist, in 1942. Unable to find a research position at a university, Wu became a physics instructor at Princeton University and at Smith College. In 1944, she joined the Manhattan Project at the Substitute Alloy Materials (SAM) Lab at Columbia University, focusing on radiation detectors. When the B Reactor at Hanford mysteriously shut down soon after it began operating, Wu helped identify poisoning by xenon-135 as the culprit. After the war, Wu was offered a position at Columbia and began investigating beta decay, which occurs when the nucleus of one element changes into another element. She made several significant contributions, including making the first confirmation of Enrico Fermi's theory of beta decay. In 1956, she was approached by theoretical physicists Tsung Dao Lee and Chen Ning Yang who knew about her expertise in beta decay. They asked her to devise an experiment to prove their theory that the law of conservation of parity did not hold true during beta decay. The law of parity states that all objects and their mirror images behave the same way, but with the left hand and right hand reversed. Wu's experiments, which utilized radioactive cobalt at near absolute zero temperatures, proved that identical nuclear particles do not always act alike. This resulted in Lee and Yang receiving the 1957 Nobel Prize in Physics for their theory, but Wu's work was not acknowledged. Wu continued making significant contributions throughout her life and won several awards and honors. In 1958, her research helped answer important biological questions about blood and sickle cell anemia. She was also the first woman to serve as president of the American Physical Society. Her awards include the National Medal of Science, the Comstock Prize, and the first honorary doctorate awarded to a woman at Princeton University. She also won the Wolf Prize in Physics in 1978. Her book Beta Decay, published in 1965, is still a standard reference for nuclear physicists. Information contributed by Ronald K. Smeltzer. 1940 Received a Ph.D. in Physics from the University of California, Berkeley. 1942 to 1944 Taught at Smith College, the University of California at Berkeley, and Princeton University, where she became the first female instructor in the Physics Department. 1944 to 1980 Professor at Columbia University.